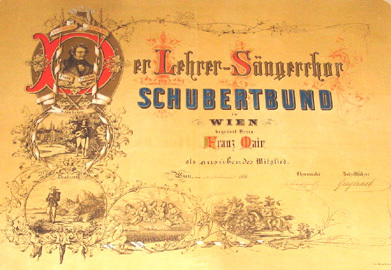 In November 1863 Franz Mair – the later director and choir-master – founded the “Lehrersängerchor Schubertbund”, a teacher’s choir. In the following year the choir first appeared in public. Due to changing its name into “Schubertbund” (since 1922 “Wiener Schubertbund” ) and opening the organization to everyone, the choir was able to gain more members. In 1935 there were 500 choir singers and they gave a concert in Rome for pope Pius IX. Before World War II notable choir-masters conducted the Wiener Schubertbund. Franz Mair, Adolf Kirchl, Dr. Anton von Webern, Viktor Keldorfer and Dr. Reinhold Schmid formed the choir to become one of the most remarkable men’s choirs in the German speaking countries. After 1945 Viktor Keldorfer, Dr. Hans Gillesberger, Prof. Leo Lehner, Prof. Heinrich Gattermeyer, Prof Franz Gerstacker and since 2001 Prof. Fritz Brucker have prolonged this tradition. Besides the care for the opus of Franz Schubert, which has always been one of the choir’s main concerns, the choir also has a wide repertoire from spiritual music to pieces for men’s choir of the Romantic period up to Austrian and international folk songs and contemporary compositions. Special opportunities to perform the opus of Schubert are the annual concerts held at Schubert’s birth place, the “Schubertiaden”. Well known composers such as Richard Strauss, Wilhelm Kienzl and Franz Lehár dedicated major works to the Wiener Schubertbund. This tradition was continued by first night performances of contemporary composers, e.g. Karl Etti and Heinrich Gattermeyer. The Wiener Schubertbund is also a founding member of the Wiener Konzerthausgesellschaft and is performing and having its headquarters in their premises since their foundation. These premises form a beautiful and traditional forum for the performances. They are also home for a big collection of manuscripts and personal things of Schubert (the most important things are in care of the Musiksammlung der Stadt Wien and the Wien Museum) and other composers as well as presents of the choirs with which the Wiener Schubertbund has relations to all over the world. A collection of documents since the foundation in 1863 up to date is historical interesting. For the honour of the Wiener Schubertbund many well known artists, scientists and politicians were and are proud of being its honorary members, e.g. Franz Grillparzer, Anton Bruckner, Peter Rosegger , Ottokar Kernstock, Wilhelm Kienzl, Richard Strauss, Ignaz Seipel, Karl Seitz, Helmut Zilk, Franz Lehar, Julius Patzak. The Wiener Schubertbund has not only performed on radio and TV, but has also recorded several compact discs, which reflect the choir’s work.